Cold with further snow for Reigate…Polar North Easterlies send Spring packing! 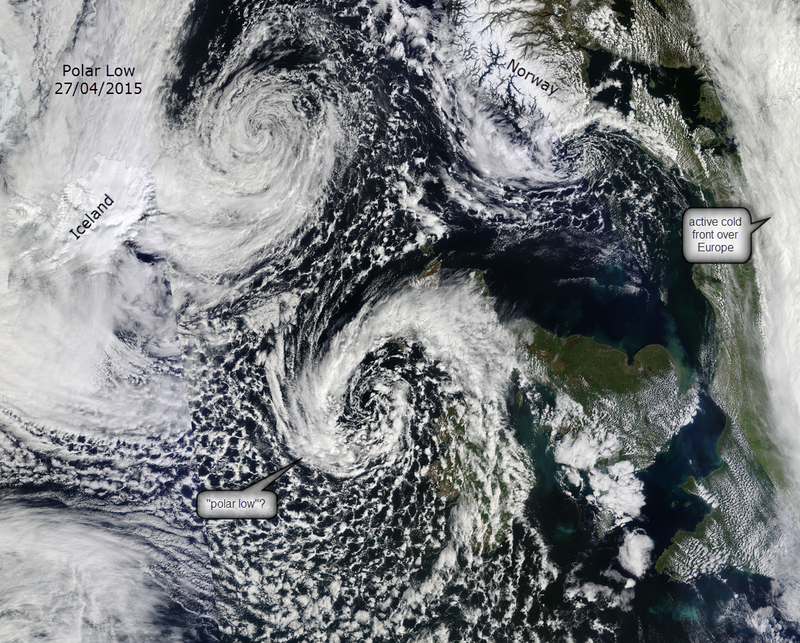 Here is the weather synopsis for this week: HIGH pressure to the north, LOW pressure to the south and a weak jetstream well to the south of the UK: result = POLAR NORTH EASTERLIES flood across the UK…again! Crazy low temperatures for March are forecast early/mid week with 850hPa temps at 1500m as low as -8°C over Reigate and surface temps struggling above freezing: wind chill as low as -9°C possible at night, daytime wind chill as low as -5ºC with winds up to 20mph feeling outrageously cold for this time of year, or any for that matter! Sunday: watch out for snow streamers developing across the SE and East Anglia as the cold easterly wind crosses a comparatively warm North Sea. The 12°C difference between sea surface temps (+6°C) and air mass temps (-6°C at 1500m) could cause instability on decaying fronts lingering near the SE. This could cause the formation of perky showers in “lines” (snow streamers) which could mean some areas get prolonged snow whilst others, a few miles away, see none at all. Monday and Tuesday: colder, drier, brighter; but snow showers always possible. COLD and SNOW: the beast meets the heat over Reigate! 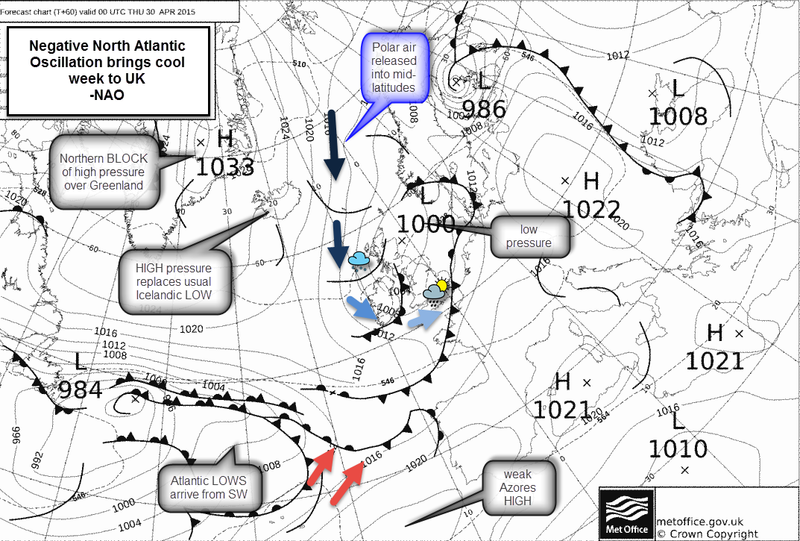 Sunday final analysis update: crossing the Channel Monday?…be warned of v cold blizzard conditions! LOW centre set to track thru N France most likely bringing only light snow to Reigate Monday morning but increasing risk of significant accumulation later in the day and overnight into Tuesday. Any shift further north in the fronts could bring heavy snow to S counties pm. 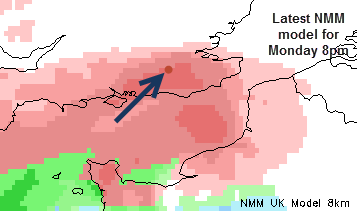 Latest hi-resolution NMM model (below) shows light snow showers all day but risk increasing to heavy snow pm extending into southern counties of England, reaching Reigate late pm or evening…. ; UKMet Office predicts the least snow of all the models.V V tricky forecast. So: Reigate forecast for Monday-Tuesday: emphasis on bitterly COLD, snowy day with extreme wind chill for (any) time of year with a low risk of heavier snow later and overnight to Tuesday, especially for places further South. so…accumulations 0 – 10cm by Tuesday am. Cold weather alert! 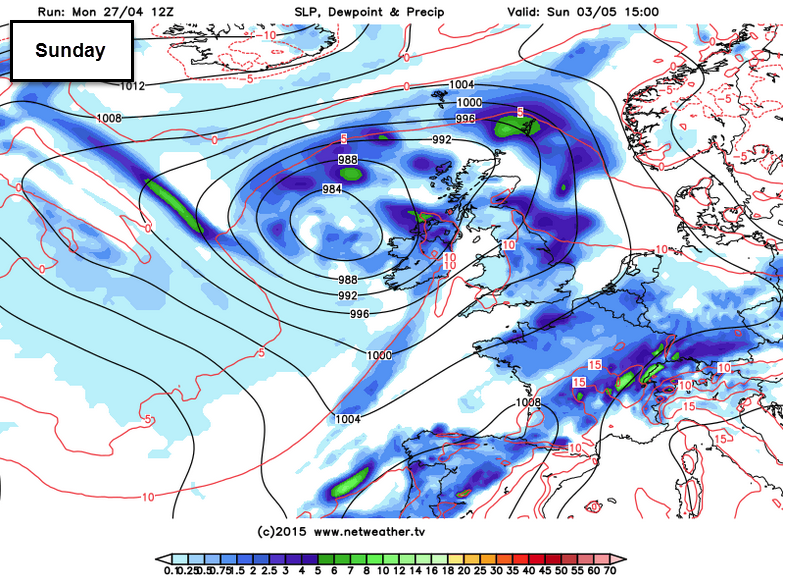 Reigate should prepare for an impressive weather change this weekend into next week. The temperature will drop like a stone over Sunday night: shown by these Reigate maximum temperatures at midday on Saturday max +11ºC, Sunday max +5ºC, Monday max -1ºC with wind chill even as low as -18ºC (yes) possible in forecast 40 mph gusts in exposed places. Winds will average 20 mph but even this will cause wind chill of -8ºC. It will feel cold on Monday! Light snowfall could start Sunday pm and continue overnight through to Monday. It may seem odd, but this snow will be caused by warm air from the South over-riding the frigid COLD Polar air blasting in from the NE: meeting at a front. Check the temperature height diagrams to see how this works: warm, moist air circulating around the LOW in the Channel will be undercut by the dense freezing cold polar air from NE. The warm air forced to rise causes cooling, condensation, cloud formation and, as upper air temperatures are so cold… SNOW is likely to fall. Possible accumulations Sunday – Monday around Reigate could be 0-3cm (higher figures on hills) and more possible to the south of the region where precipitation could be more intense nearer the fronts. So…positioning of the LOW is critical. The snow maps give an idea of potential snow areas in the south on Monday. There could be light snow showers on and off in Reigate and another moderate fall is possible Monday pm as the LOW tracks nearer to the south east of our region. It will feel cold in strong gusts from the East: wind chills down to an outrageous -18ºC are theoretically possible if you are caught in strong easterly gusts with air temps below 0ºC all day. Temperatures will actually fall through the day on Monday as the Polar air takes a grip. Lowest temperatures all winter are possible overnight Monday-Tuesday. Hopefully, this weather change will not take anyone by surprise: it has been on the cards for over a week and flagged up here on 2 March. The rest of the week will remain cold, but feel less cold in light winds, and drier with pressure building from the north, but more snow might precede rain later in the week as things warm a little next weekend. 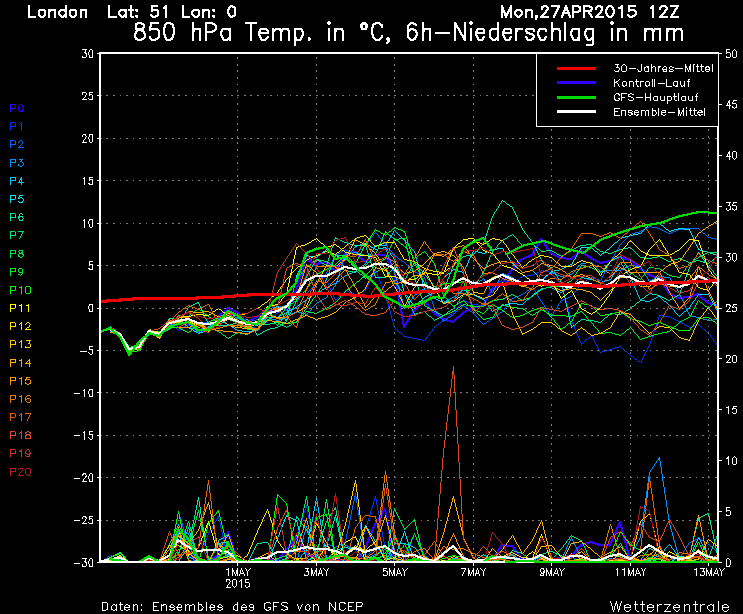 More updates later as details emerge for Monday which is still v changeable! From ice sheet to high street! Arctic air travelling courtesy of the jet stream will blow in from Greenland and deliver frigid temperatures and snow to Reigate for the first part of this week. Precise details of snowfall are still changeable but temperatures are certainly due to take a fall during this week but getting there will not be straightforward! Light snow on Monday (see map left) currently forecast to start falling in Reigate early am (updated sun07:30), could reach 6cm (update 8pm sunday:unlikely – looks much less now) but, oddly, temperatures may rise considerably above freezing Monday afternoon (+4°C?) and bring rain for a while probably melting any fallen snow before cooling down Monday night with more snow possible: a v complex situation which will change hourly! A developing LOW along an occluded front later on could bring more snow to the SE on Tuesday when air temperatures will probably stay below freezing all day and wind chill at midday could be as low as -9°C. The reason on Monday & Tuesday … a strong jet stream blowing direct from Greenland at over 100mph, 9km above our head, will bring Arctic air (-50°C at 9km) direct to Reigate in less than 24 hours journey time from “ice sheet to high street”! A BLOCKING HIGH sitting out west in the Atlantic is preventing milder air from making progress further east. The cold weather will continue so long as the HIGH stays put. The situation is likely to remain much the same for a while, though at the moment forecasts are uncertain beyond a few days ahead due to the “sudden stratospheric warming” which is taxing every super-computer weather forecasting model including the UK Met Office, let alone your friendly RGSweather station enthusiasts! Update! by mid-week the HIGH will slip over to the north of the UK and drag in bitterly cold easterlies from the continent (see map wednesday thursday) Snow showers likely for eastern England.